One month ago the summit lava lake was at the rim of the Overlook crater (the small crater in the center of the photo), spilling lava onto the floor of Halemaʻumaʻu Crater (the larger crater that fills much of the photo), creating the dark flows surrounding the Overlook crater. Since that time the lava lake has dropped, associated with summit deflation, and today the lake level was about 60 meters (200 feet) below the Overlook crater rim. The stack of recent overflows is visible on the wall of the Overlook crater as the layer of dark lava atop the older, light colored lava forming the majority of the Overlook crater wall. 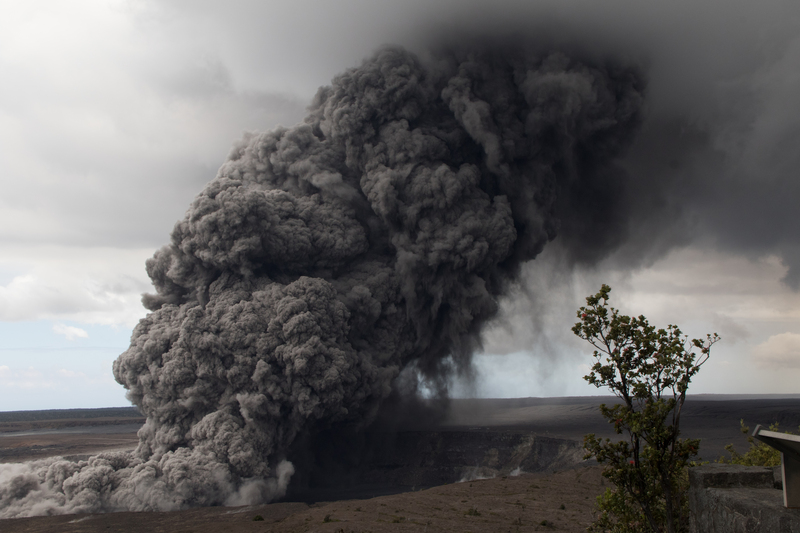 The photo is taken from the southeast rim of Halemaʻumaʻu Crater. The closed Halemaʻumaʻu overlook is in the upper left corner of the photo. Jaggar Museum and HVO can be seen as a small bump on the horizon in the upper right portion of the photograph. Kīlauea Volcano’s summit lava lake continued to drop today (May 15, 2015). 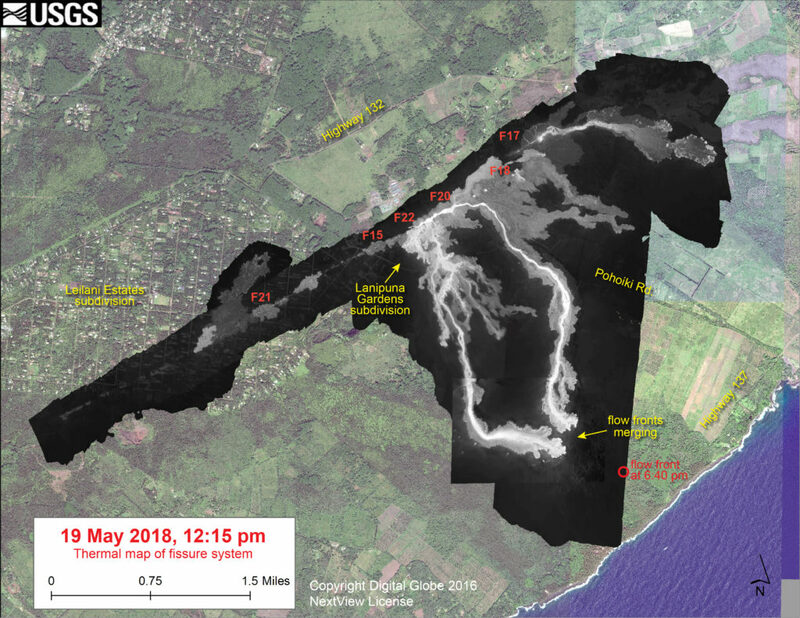 Measurements of the lake surface late this afternoon showed that it was 62 m (203 ft) below the top of the newly-created vent rim, a ridge (or levee) of solidified lava about 8 m (26 ft) thick that accumulated on top of the Halemaʻumaʻu Crater floor from multiple overflows of the vent during the past two weeks. 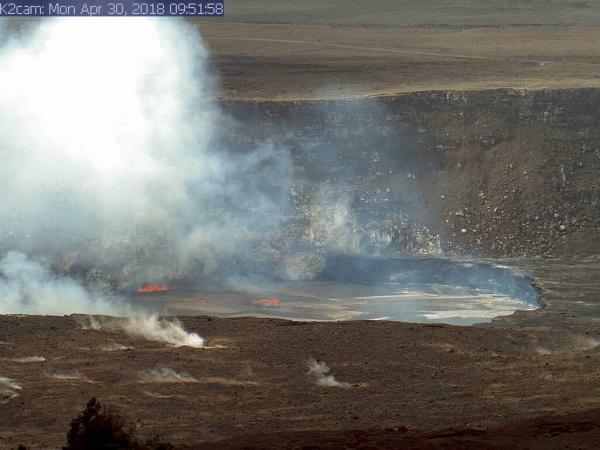 This sequence of HVO webcam images of Kīlauea Volcano’s summit vent, recorded between 1:28 and 1:32 p.m., HST, on May 12, 2015, captures the moment a section of the dark-colored “bathtub ring” (a veneer of fresh lava that coats the vent wall as the lava lake level drops) fell into the lava lake (center). The lava veneer collapse, which produced a visible cloud of rock and lava fragments, agitated the lava lake surface and exposed lighter-colored layers of older rock in the vent wall (right). 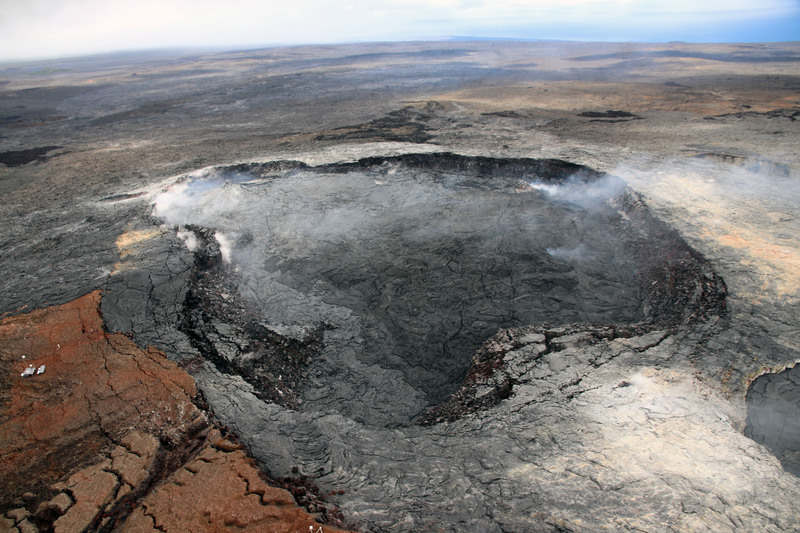 The lava lake in the Overlook crater, within Halemaʻumaʻu Crater at Kīlauea’s summit, remains at a high level and close to the Overlook crater rim. Overflows onto the Halemaʻumaʻu Crater floor have built up the rim of the Overlook crater several meters, and recent overflows are visible in the right side of the photograph. The lake level this afternoon was about 7 meters (yards) above the original (pre-overflow) floor of Halemaʻumaʻu Crater. This Quicktime movie shows spattering at the margin of the summit lava lake in Halemaʻumaʻu Crater. Spattering has been common at the lake, and when it occurs is easily visible from the public viewing area at Jaggar Museum. This video shows a closer view from the rim of Halemaʻumaʻu, which is closed to the public due to volcanic hazards. 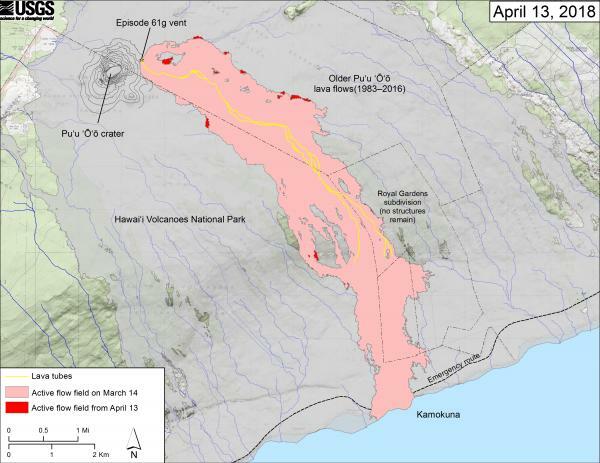 The June 27th lava flow remains active, with breakouts focused in several areas northeast of Puʻu ʻŌʻō. The farthest downslope activity observed on today’s overflight was roughly 8 km (5 miles) northeast of Puʻu ʻŌʻō. One of several lobes on the June 27th flow that was at the forest boundary today, burning vegetation northeast of Puʻu ʻŌʻō. Over the past week, the summit lava lake in the Overlook crater rose and spilled out onto the floor of Halemaʻumaʻu Crater, creating the dark flows in the south part of Halemaʻumaʻu (left side of crater from this direction). The extent of the lake itself, set within the Overlook crater, is slightly difficult to distinguish from this view but the spattering at the lake margin is visible. The overflows onto the Halemaʻumaʻu Crater floor, not counting the area of the lake itself, total about 11 hectares (28 acres). A closer look at the lava lake and overflows on the floor of Halemaʻumaʻu Crater. The outline of the Overlook crater, and the active lake, is easier to distinguish in this view. From this angle, the extent of the lava lake within the Overlook crater is much easier to distinguish from the surrounding overflows. The closed Halemaʻumaʻu parking lot is in the right side of the photograph. The ocean entry east of the National Park boundary near Kupapaʻu Point remains weak, with a wispy plume, as seen in this photo looking southwest along the coast. The main entry point of the Kupapaʻu ocean entry comprises a few small streams of lava, seen here cascading into the water. 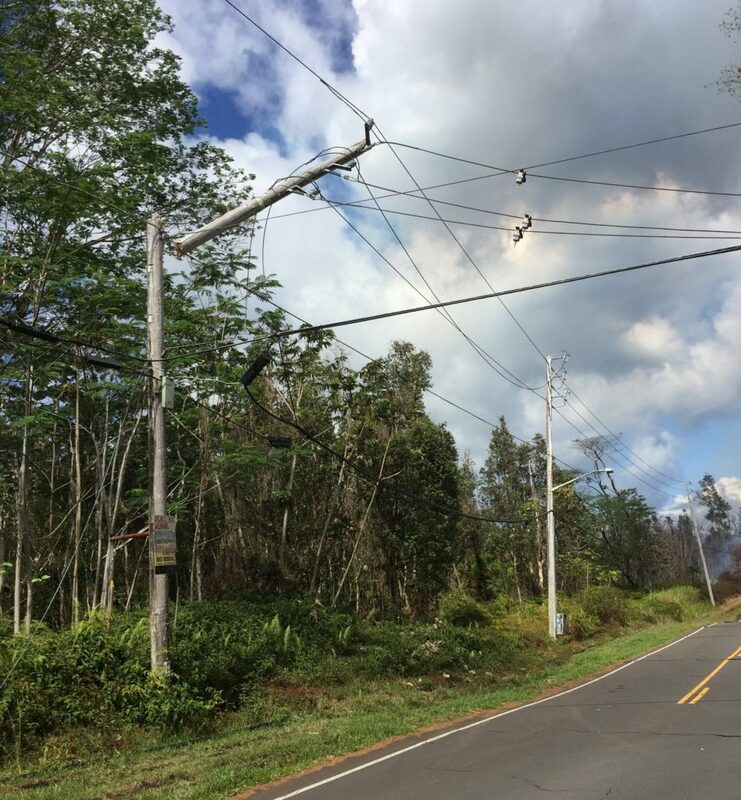 The Kahaualeʻa 2 flow continues to invade the forest line north of Puʻu ʻŌʻō. Poor weather prevented good views but made for an eerie scene. The lava lake in Halemaʻumaʻu was 35 m (115 ft) below the floor of the crater yesterday morning. The lake is about 220 m (720 ft) long and 160 m (525 ft) wide. 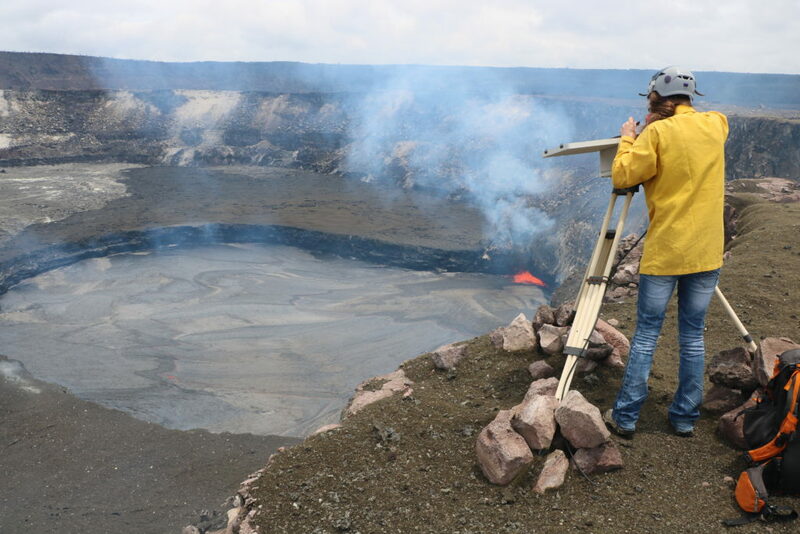 A thin gas plume permitted a decent view of the south wall of the pit holding the lava lake in Halemaʻumaʻu. Yesterday the lava lake was not spattering at its usual point near the left side of the lake in this view. This wall is overhung by up to 15 m.
Instead, the lava lake was spattering at points on the west and northwest side of the lake. If the lake continues to rise, pieces of this overhang may collapse (note the cracks at lower right marking planes of weakness).